Cheetah Mobile is known for offering high quality apps that help users to protect the data on their devices and to boost their performance. This Chinese company offers a great selection of options including popular apps like Security Master, Clean Master and QuickPic Gallery. 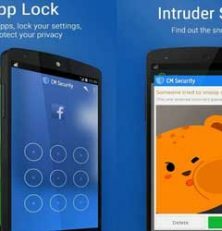 Another solution they offer is AppLock – Intruder Selfie, a practical app that is designed to enhance the privacy of your mobile phone. You can download AppLock for free and enjoy its convenient functionality without having to pay anything. The app lets you protect important information and private files from unauthorized access. It does it by setting a lock that prevents other users from seeing what’s on your device. Here we’ll take a closer look at AppLock. CM AppLock is still relatively new, but it has already earned a good rating in Google Play Store. You can download it for free and it works on any Android device running Android 4.0 (Ice Cream Sandwich) and above. There is also the possibility of downloading AppLock’s 1.0.0 version as an APK File from the Android Market. Once the app is installed on your device, it uses around 7.22 MB of your device’s internal storage memory and when you don’t use it that much, it uses up about 5.5 MB to maximum 100 MB of RAM. In order to set up the app, you only need to follow a few simple steps. Once the app has been installed on your device, you just need to launch it. You will immediately see a list of apps that you may use on a regular basis to store personal information and files. You can select the apps for which you want to boost the security and when you have completed the selection, you can tap on the Protect option. When you do this, the app opens a new window and you will be asked to create a new passcode. This can be a pattern or a 4-digit PIN code. Once you have chosen the code or pattern that you want to use to secure the data, CM AppLock will direct you to the “Apps with usage access” option in the settings. Next, you will be asked to “permit usage access” so that it can track which other apps you are using and how regularly. It can also check language settings and other information. Keep in mind that if this option is not enabled, AppLock won’t work as it should and it won’t be possible to lock any app on your device. If you allow usage access to CM AppLock, it will take you to the main screen quickly and there, you will be able to lock on device apps, or unlock them. You can also provide an option to change the app’s settings. One of the best things about CM AppLock is the fact that it can use your phone’s built-in front camera to take a photo of anyone who tries to access your device without authorization. The feature is enabled by default, but it is optional and you can deactivate it if preferred. If someone enters the wrong password twice, the app will take a photo of them. This is a convenient solution to find out who is trying to access your device’s information. You can also adjust the settings of this feature to choose how many attempts are allowed before a photo is taken. The selfie captured by AppLock is stored on your device and the app can send it to you by email, if you want. The main benefit of using CM AppLock is that it allows you to lock apps like Facebook Messenger, WhatsApp and Contacts, which are likely to contain private information. AppLock helps you to protect your data from prying eyes and it also works as a way to prevent your kids to make online purchases without your permission. You can adjust the lock settings to stop them from buying apps and games. AppLock also allows you to protect your photos, files and gallery. In addition, it can take a picture of the person who tries to unlock your device/apps. The main problem is that the app can be uninstalled by anyone. In addition, some users have reported that the applock freezes sometimes. Some have also mentioned that the app is not effective in all cases and that sometimes, it doesn’t even lock the apps. CM AppLock promises to offer a practical way to protect private information from prying eyes. It is easy to set up and to use and when it works well, it prevents others from accessing your apps by locking them. There are not many features available and according to some reports by users, the performance of the app is not always effective. However, we hope that Cheetah Mobile addresses the issues in future releases and updates the app to offer higher security, more features and efficiency.